‘Tan’ up ‘pon you’ foot! Him no wan’ fe wuk. “Lard! me Gahd o’ me! You caan’ wuk a tup . “Cotch Donkey” is the first piece of dialect poetry that Claude McKay showed to his mentor, Walter Jekyll. It was the only dialect piece he included with a portfolio of standard English poetry, and it was the only one that Jekyll felt was authentic. Although McKay was apprehensive about showing Jekyll the piece, Jekyll responded, ““this is the real thing. The Jamaican dialect has never been put into literary form except in my Annancy stories. Now is your chance as a native boy to put the Jamaica dialect into literary language” (Jenkins, 15). A simple poem about an obstinate donkey, “Cotch Donkey,” and Jekyll’s response to it, gave McKay the encouragement to write poetry in a language considered inferior or base. McKay himself thought his native language to be unworthy of a poetic form until his mentor encouraged him to explore an untested form of expression. Yet his pioneering poems like “Cotch Donkey” opened up paths for subsequent West Indian poets to follow and to further explore; for the first time, Jamaican dialect was used as a legitimate poetic form. Winston James writes, “[Premier Jamaican poet Louise] Bennett said it was “thrilling” to see the language in print…McKay’s early writing “reinforced Bennett’s love of her primary language”” (James, 140). 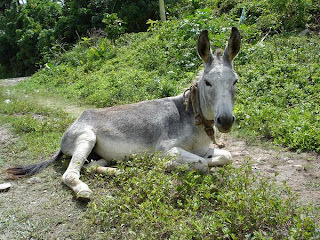 McKay made writing in Jamaican dialect acceptable; “Cotch Donkey” was the first of eighty-eight dialect poems that opened the barred gates for other Jamaican poets. James comments that, “it is because of McKay that Bennett and others have been able to supersede him—in form, if not in thought” (James, 151).